July 31, 2013 | Welcome to Little Gull Marina! Well the weather sure changed after the storm 2 weeks ago! Its feeling a bit more like august already with cool mornings and beautiful sunny days. Hopefully we get nice weather for the upcoming long weekend! As far as we know, all power has been restored to the area with the exception of customers who lost the mast that feeds their cottage directly. Bell is still trying to restore phone service in some areas. The annual long weekend fireworks will be taking place again this year on Saturday night, with a rain date of Sunday. The display will be on Gold Lake so load up your boats and come join the masses! Thanks to Sally, we have a colouring contest going on out here so for all those kids out there who like to colour, be sure to drop by and pick a picture. The contest ends on August 17th. 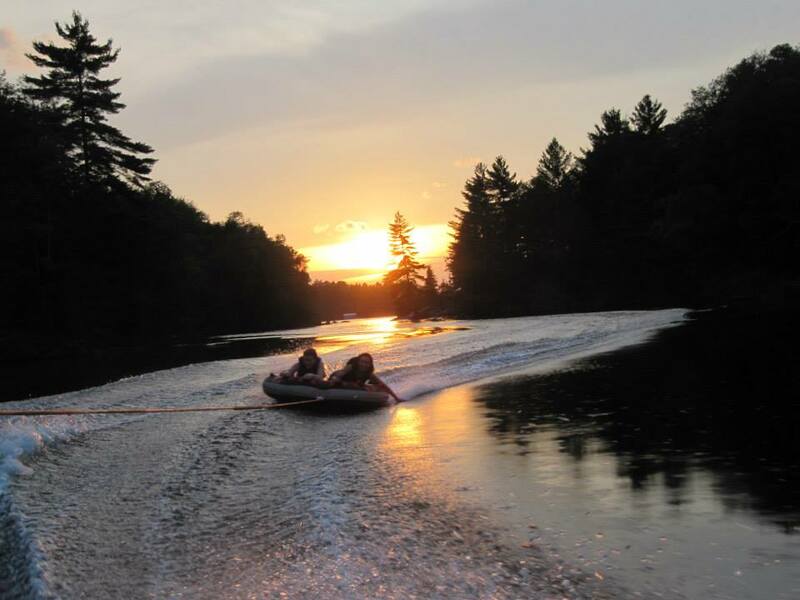 We got the girls out for some tubing fun after work last week so today’s picture is Heather and Shawna’s sunset cruise on a tube. We’re looking forward to seeing everyone out and about this weekend. The candy counter and ice cream freezers are nice and full for kids of all ages to get that sugar fix!